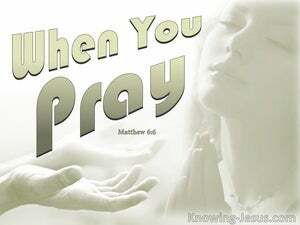 ﻿ Matthew 6:6 But whenever you pray, go into your room, close the door, and pray to your Father who is hidden. And your Father who sees from the hidden place will reward you. But thou, when thou pray, enter into thy private room, and having shut thy door, pray to thy Father in secret, and thy Father who sees in secret will reward thee in the open. 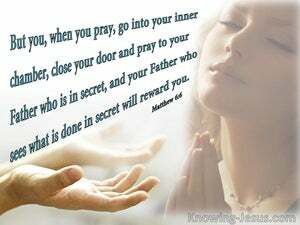 But when you pray, go into your [most] private room, and, closing the door, pray to your Father, Who is in secret; and your Father, Who sees in secret, will reward you in the open. But when you pray, go to a private place and after closing the door, pray to your Father who is in a secret place, and [since] He sees in secret places, He will reward you. But do you, when you pray, go into your closet, and when you have closed the door, pray to your Father who is in secret: and your Father who sees in secret will reward you openly. But when you pray, go into your room, shut the door and pray to your Father, who is in secret; and your Father, who sees in secret, will reward you. but you, when you pray, enter into your closet, and when you have shut the door, pray to your father who is with you in your retirement, and your father who observeth the actions of your retirement shall reward you. But thou, when thou prayest, enter into thy chamber, and having shut thy door, pray to thy Father who is in secret, and thy Father who sees in secret will render it to thee. But when thou mayest pray, enter into thy closet, and having closed thy door, pray to thy Father who is in secret, and thy Father who seeth in secret will reward thee openly. But when you pray, go into your own room, and shut the door, and pray to your Father who is unseen, and your Father who sees what is secret will reward you. But thou, when thou prayest, enter into thy closet, and having shut thy door, pray to thy Father who is in secret, and thy Father, who seeth in secret, shall reward thee openly. But thou, when thou prayest, enter into thy store-house, and having shut thy door, pray to thy Father which in secret; and thy Father who seeing in secret shall give back to thee openly. But whenever you pray, enter into your inner room and shut your door [and] pray to your Father who is in secret, and your Father who sees in secret will reward you. But when thou prayest, enter into thy chamber, and shut thy door to thee, and pray to thy father which is in secret; and thy father which seeth in secret, shall reward thee openly. When you pray, go into your room and shut the door, pray to your Father who is in secret, and your Father who sees what is secret will reward you. "But you, when you pray, go into your own room and shut your door; pray to your Father who is in secret, and your Father who sees in secret will reward you. But you, when you pray, enter into your inner chamber, and having shut your door, pray to your Father who is in secret, and your Father who sees in secret will reward you. But do thou, when thou prayest, enter into thy closet, and, when thou hast shut thy door, pray to thy Father who is in secret; and thy Father, who seeth in secret, will reward thee. But when you pray enter into your private room, and having shut your door pray to your Father who is in secret; and your Father who sees in secret shall reward you. But, thou, when thou wouldest pray, enter into thy closet, and, fastening thy door, pray unto thy Father who is in secret, - and, thy Father who seeth in secret, will reward thee. But when thou prayest, enter into thy closet, and shut thy door, to pray to thy Father who is in secret; and thy Father who seeth in secret shall reward thee openly. But, when one of you prays, let him go into his own room, shut the door, and pray to his Father who dwells in secret; and his Father, who sees what is secret, will recompense him. But thou, when thou prayest, enter into thy closet, and when thou hast shut thy door, pray to thy Father who is in secret, and thy Father who seeth in secret, will reward thee openly. But whenever you, follower of mine, pray, you must go to your most private place, shut the door, and pray to your Father in secret, and your Father who sees what is secret will reward you. But when you pray, enter into your closet; and, having closed your door, pray to your Father Who is in secret; and your Father Who seeth in secret will recompense you. 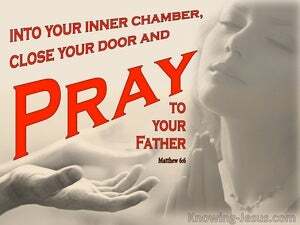 But thou, when thou mayest pray, go into thy chamber, and having shut thy door, pray to thy Father who is in secret, and thy Father who is seeing in secret, shall reward thee manifestly. 5 "And whenever you pray, don't be like the hypocrites who love to stand in the synagogues and on the street corners so that they will be seen by people. I tell all of you with certainty, they have their full reward! 6 But whenever you pray, go into your room, close the door, and pray to your Father who is hidden. And your Father who sees from the hidden place will reward you. 7 "When you are praying, don't say meaningless things like the unbelievers do, because they think they will be heard by being so wordy. So he entered, shut the door behind them both, and prayed to the LORD. Come, my people, enter your rooms and shut your doors behind you. Hide yourselves for a little while until the fury has passed by. so that your fasting will not be noticed by others but by your Father who is in the hidden place. And your Father who watches from the hidden place will reward you." Then Jesus went with them to a place called Gethsemane. He told the disciples, "Sit down here while I go over there and pray." Peter made them all go outside. After kneeling down, he prayed, turned to the body, and said, "Tabitha, get up!" She opened her eyes, and when she saw Peter, she sat up. After dismissing the crowds, he went up on a hillside by himself to pray. When evening came, he was there alone. Nathaniel asked him, "How do you know me?" Jesus answered him, "Before Philip called you, while you were under the fig tree, I saw you." Jesus told her, "Don't hold on to me, because I haven't yet ascended to the Father. But go to my brothers and tell them, "I'm ascending to my Father and your Father, to my God and your God.'" so that your giving may be done in secret. And your Father who sees in secret will reward you."